The first time you log on to AS/400 you will be forced to change your password before continuing. 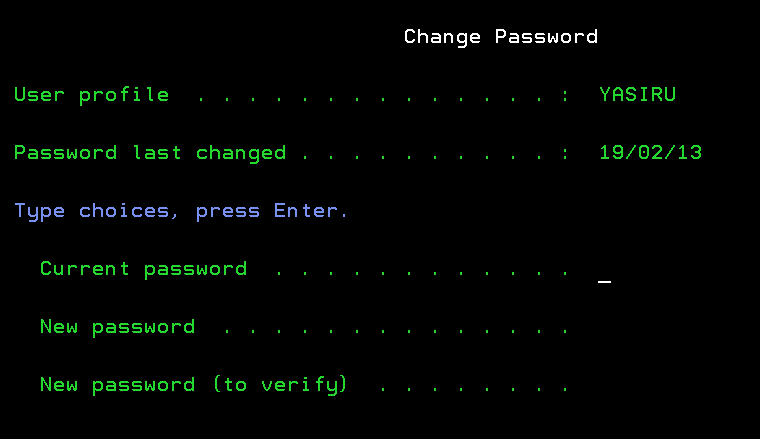 Press <Enter>to change your password. At the “Current Password” field, type your current password. NOTE: nothing you type on this screen will be displayed to ensure that no one views your password as you type it. For the “New Password” field, type the password you would like to use when you sign on to the computer. It must not exceed 10 characters, it must begin with an alphabetic character and the remaining characters may be any combination of alphabetic, numeric characters. Note: Try not to make it too difficult, you will need to know it to sign on the AS/400 again. At the “New Password (to verify)” field, type in your new password for a second time to make sure you have entered it correctly. If you have entered it incorrectly you will get an error message and your initial password will still be as before. Read the following screens, pressing <Enter>to exit each one, until you reach the AS/400 Main Menu screen. Later on when you want to change your password, type CHGPWD on the command line and go through the same steps.